I love swiss chard. In fact, not only do I love preparing and eating this beautiful vegetable, it just so happens to be one of my favorite leafy greens that we grow here at Tumbleweed Farm. Not only is chard stunning to look at but its mild flavor is something that makes it easy to toss into a variety of dishes. It’s great stirred into stews, pasta, drizzle with olive oil and lemon juice, or simply made into pesto (greens only). We get a lot of questions at the farmers market about cooking with chard and I thought this recipe would be a great one for folks to reference if they typically shy away from this leafy green. This salad a breeze to prepare and is bursting with so many fresh flavors that I can’t help but think it will be a new favorite in your household too. We prepared the greens (stems and all!) with some golden raisins for a little sweetness and some aged parmesan cheese for a little saltiness. The combination of flavors here is spot on and I’m really happy with how simple and delicious this is. We served this salad alongside some beautiful lamb chops that we got at the farmers market from our good friends at Sakura Ridge down in Hood River. Dinner was simple and delicious and I hope you all love this swiss chard side dish as much as we do. And hey, if you’re looking for more ways to cook with chard check out my Dish up a Veggie page and search chard recipes here. Heat a large dry skillet over medium high heat. Add the almonds and cook, shaking the pan occasionally, until toasted. About 3 minutes. Remove from the heat and when cool enough to handle roughly chop. Heat the olive oil in the same large skillet over medium heat. Add the garlic and shallot and cook, stirring occasionally, until fragrant and beginning to soften. About 1 minute. Add the chard stems, golden raisins and white wine. Simmer the mixture until the chard stems become tender, the raisins are plump, and the liquid reduces a bit, about 5 minutes. Stir in the chard leaves and a hefty pinch of salt and pepper. Continue to cook until the chard leaves turn bright green and tender. About 2-3 minutes. Stir in the lemon juice, parmesan cheese and sprinkle with the toasted and chopped almonds. Season to taste with additional salt and pepper if need be. 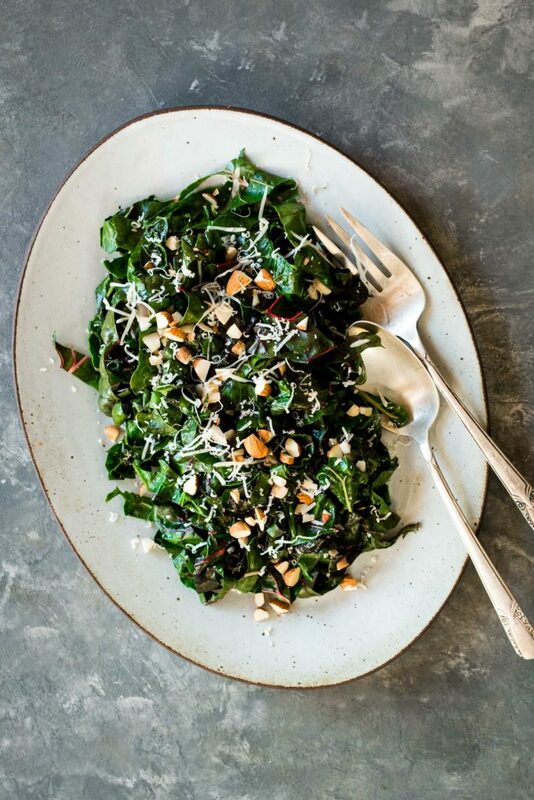 Andrea, your chard is nothing short of a green phenomenon. In fact, it inspired a blogpost from me– amoozboosh.com–and was published in “Savor” last Saturday (insert in the Hood River News). Hope you caught it. See you next week at the market. Thanks for all you do to keep us licking our chops! Yet another amazing recipe Andrea. And so easy to make! My guy LOVED this one. Planning to make it again this week. It’s that good.